WASHINGTON — House Speaker Paul Ryan was Donald Trump’s opposite in many ways — in demeanor and style, on trade, entitlements and even immigration. And that’s why Ryan’s announcement that he won’t seek re-election in November was more of a story about Trump’s now-total takeover of the Republican Party than about the midterms (though we’ll get to that down below). 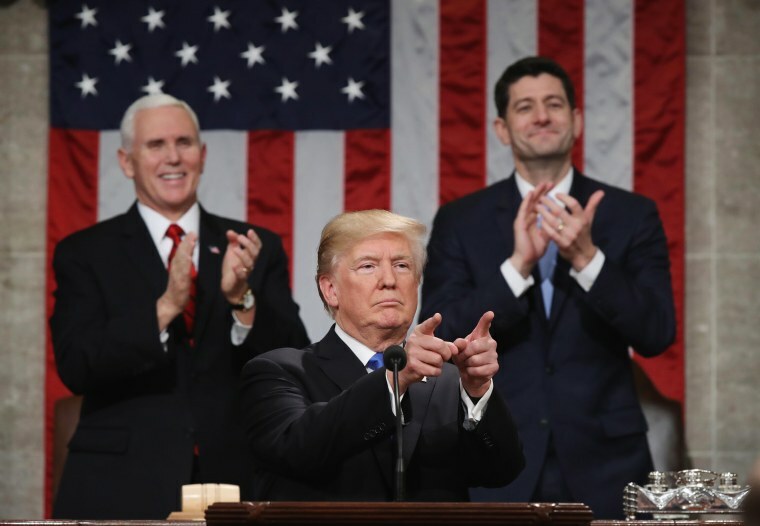 Perhaps the clearest sign of how Trumpism is winning inside the GOP was the photo Trump released from last night with all of the Republican leaders — including Ryan — giving Trump’s patented thumbs-up. Another sign was the data from our March 2018 NBC/WSJ poll, with 50 percent of Republicans viewing Ryan positively and 11 percent negatively (+39), versus 78 percent positive/13 percent negative for Trump (+65). Ryan’s departure is a significant blow to the Chamber of Commerce/Wall Street Journal editorial page wing of the Republican Party, which was already bruised after the 2016 election. Maybe their next leader will be Mitt Romney if he wins (as expected) his Senate contest. Or maybe it will be another Republican down the road. But it won’t be Paul Ryan. Ryan’s decision not to seek re-election doesn’t fundamentally alter the political landscape – Republicans were the underdogs to keep control of the House of Representatives before Ryan’s announcement, and they’re still the underdogs afterward. Retirements: 25 House Republicans now have announced they won’t seek re-election in the fall, and another 13 left their seats to run for a different office. That’s the highest GOP number here in modern history, according to Vital Statistics on Congress. By comparison, there are a total of 17 Dem retirements/seeking higher office. Competitive seats: The Cook Political Report now identifies 53 House GOP seats as competitive or a likely Dem takeover, compared with 14 seats for Dems. The magic number for Democrats is 23, so they need to win less than half of those GOP seats to win control of Congress. Fundraising: While NRCC Chair Steve Stivers told one of us that the Kevin McCarthy-vs.-Steve Scalise race for GOP leader can help pick up the slack, Ryan was the best fundraiser for the House GOP. And now Senate Republicans are signaling that THEY should be the ones who get the GOP money. “It seems clear now that the fight is to hold the Senate,” Billy Piper, a lobbyist and former chief of staff to Senator Mitch McConnell, tells the New York Times. Make no mistake: Republicans can still hold on to the House come November — they will have plenty of money, much of the terrain is on GOP turf and 2016 is a reminder that ANYTHING can happen in politics. But they are in a slightly tougher place today than they were on Monday. And in case you were looking for additional retirements — GOP or Dem — here’s a list of the states whose filing deadlines haven’t yet expired. The bipartisan investigative committee looking at the allegations against Republican Gov. Eric Greitens released its findings Wednesday, and they’re explosive — with top Republicans calling on the governor to resign or face disciplinary proceedings. State Attorney General Josh Hawley (R), who is challenging Sen. Claire McCaskill, called on Greitens to resign. And the Republican leaders of the state House and Senate said the findings were significant enough “to warrant a special session to consider disciplinary actions, including impeachment,” the Star adds. In case you missed them, here are some of the recent midterm developments that we’ve chronicled on our “Rundown” blog: One of us notes how Paul Ryan’s congressional district isn’t a slam dunk for the GOP to hold, with Barack Obama winning it in 2008 and narrowly losing it in 2012… NBC’s Andrew Rafferty writes up Rep. Dennis Ross’, R-Fla., decision not to run for re-election… And a poll taken BEFORE yesterday’s revelations found 48 percent of Missouri voters saying embattled Gov. Greitens should resign. And be sure to check out our afternoon/evening flash news briefing – The Lid. Whether it’s news about politics, election data, our industry-leading polls, Chuck Todd and the NBC News Political Unit run down the most important stories from Washington every weekday evening to help you make sense of it all.